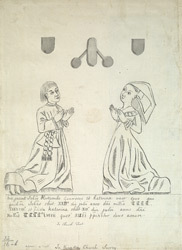 Sketch of two brass monuments of John Hertcombe, Gentleman, who died in 1488 and his wife Katherine. These brass monuments stood in the south transcept of All Saints Church in Kingston Upon Thames. The south transcept was built in the 15th century and it is probable that the Hertcombes were benefactors. The kneeling figures are 9 inches tall and are wearing the costume of 15th century lay persons.